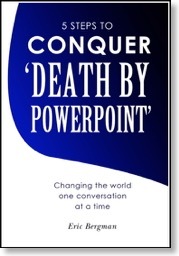 In most business presentations today, the practice is to develop ideas in a software package (most often PowerPoint), print them out as a deck or project them onto a screen, and assume that the end result has a good chance of being successful. But is this as effective as people have been conditioned to believe? Canadian visionary Marshall McLuhan told us that "the medium is the message." If we accept Professor McLuhan's views on the subject, then how does this apply to presentations? What is the medium? And how does the message travel through the medium to be received and understood by the audience? Before turning to group presentations, let's look at a similar situation in another example of face-to-face communication — a sales presentation. Suppose you're delivering a pitch to one or two prospects. You have a brochure that summarizes the features and benefits of your product. It's colourful, dynamic, filled with pictures and charts, and highly readable. Do you hand the brochure to your prospects while you're delivering your sales presentation? Probably not. If you do, the colour draws their attention and the content keeps it there. Even if the prospects struggle to listen to you, chances are you've lost them. Like all of us, your prospects cannot read and listen at the same time. You know, either by instinct or experience, that keeping their attention means giving them handouts at the end of the sales presentation. During the presentation itself, you make the exchange a two-way process; you know that the speed at which information is presented should be determined by their needs, not yours. Compare this to a "modern" presentation in which there are a half dozen prospects listening to the same salesperson trying to achieve the same results. This time, while presenting to the group, you have a software package in which the colours, charts and copy from the brochure can be copied, pasted and projected onto a screen. The technology is marvellous. You simply click a mouse and there it is. Do you use the technology if it's available? Probably. But once you start using the technology, it's tough to stop. First there were only a few pictures. Then the charts. By the time you're done, even your notes are projected onto the screen. During your actual presentation, what does the audience do? Well, at the risk of sounding repetitive, the colour draws their attention. The content keeps it. And even if they struggle valiantly, chances are they're having difficulty listening to what you say. If you've ever sat through a presentation and thought to yourself "they could have printed out the visuals and I would have gotten as much value out of the presentation by reading them," you've seen this process in action. In every presentation you deliver, you must achieve two goals. You must convey your message. To do that, you must also convey your personality. If "the medium is the message," it's your personality — not the software package on your computer or the light emitting diodes on the projector — that the message must travel through to be received, understood and acted upon by the audience. Visuals are a spice. Like any spice, they can add flavour. But too much can ruin the meal. In your presentations, learn to apply the skills you've developed one-on-one to the challenge of presenting to groups. Relax. Be natural. Make the process two-way and interactive (even if you do most of the talking). Don't let it become a boring, one-way transmission of information. And never forget that there is a clear and distinct difference between a visual aid ... and a visual crutch. Look to the former; don't lean on the latter.